Keep us, O Lord, constant in faith and zealous in witness, that, like thy servant William Laud, we may live in thy fear, die in thy favor, and rest in thy peace; for the sake of Jesus Christ thy Son our Lord, who liveth and reigneth with thee and the Holy Spirit, one God, for ever and ever. Keep us, O Lord, constant in faith and zealous in witness, that, like your servant William Laud, we may live in your fear, die in your favor, and rest in your peace; for the sake of Jesus Christ your Son our Lord, who lives and reigns with you and the Holy Spirit, one God, for ever and ever. 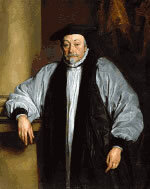 William Laud, born in 1573, was Archbishop of Canterbury from 1633 to 1645 in the days of King Charles I. It was a turbulent time throughout, one of violent divisions in the Church of England, eventually culminating in the English Civil War. An example is the surplice controversy. We have all encountered Christians who are opposed to celebrating Christmas on the grounds that (a) the Bible nowhere commands us to celebrate Christmas, and does not mention the 25th of December; and (b) the pagans had a festival in December at which they built fires and feasted and exchanged gifts, from which it follows that those who celebrate Christmas are participating in pagan rites. Similarly, in the late 1500's and early 1600's, there were Christians in England who objected to the garment called the surplice. When participating in the services of Morning and Evening Prayer in Church, clergy, including choir members, normally wore a cassock (a black, floor-length, fairly tight-fitting garment) covered by a surplice (a white, knee-length, fairly loose garment with loose sleeves). The Puritans objected to the surplice (a) as not mentioned in the Bible, and (b) as something that the Roman Catholics had worn before the Reformation, which made it one of the props of idolatrous worship, and marked anyone who wore it as an idolater. Archbishop Laud regarded it as a seemly, dignified, garment, an appropriate response to the Apostle Paul's injunction, "Let all things be done decently and in order." The Puritans stood by their objections, and violently interrupted services at which the surplice was worn. On one occasion, a group of Puritans broke into an Oxford chapel the night before a service and stole the surplices, which they thrust into a the dung-pit of a privy. Again, a woman marched into Lichfield Cathedral, accompanied by the town clerk and his wife, and ruined the altar hangings with a bucket of pitch. Under English Law, it was part of Laud's office as Archbishop to maintain order and to punish offences against the peace of the Church. He made it his practice to proceed not only against poor and obscure offenders, but also, perhaps especially, against rich and powerful ones. It is well that men should be equal before the law, but his integrity on this point ultimately cost Laud his life. Laud made enemies chiefly in three ways. (1) He punished those who attacked the Church, both those who vandalized and those who merely scolded. (2) He upheld various customs in public worship (such as the wearing of the surplice) that were harmless in themselves, but which aroused the suspicion and fury of those who feared a return to power of Roman Catholicism. (3) He sought the financial independence of the clergy, so that a preacher was not dependent on what support the local squire was pleased to give him. His proposed means to this end was to restore to the Church some of the Church lands that had been seized by Henry VIII and given or sold to various nobles and gentlemen. The proposal never reached the stage of discussion about details, so it was not clear how compensation would be handled, but the mere whisper of such a proposal was enough to make every landholder in the country feel personally threatened. In 1637 an attempt was made to introduce the Book of Common Prayer into general use in Scotland [note: this book is online at the Book of Common Prayer site], and it immediately caused rioting. 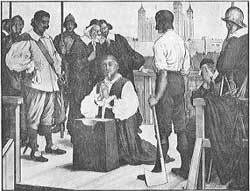 In February of 1638, Scottish leaders signed the National Covenant, by which they pledged themselves to uphold the Puritan position by force, and by the end of the year they had voted to depose and excommunicate every bishop in Scotland. The unrest spread to England, and in 1640 Laud was arrested on a charge of high treason. He was kept in the Tower for four years, and tried in 1644, at the age of seventy-one. He was found guilty, not because there was any evidence of his guilt, but because the House of Commons was determined that he should die. On the scaffold he prayed: "The Lord receive my soul, and have mercy on me, and bless this kingdom with peace and charity, that there may not be this effusion of Christian blood amongst them."